So muses Khalid Khan, a seventeen-year-old Afghan boy living in Melbourne. Khalid is like any other boy his age in Australia. He loves his footy and his mum’s cooking. He finds his dad’s idiosyncrasies endearing and amusing. He takes every opportunity to tease his sister, Aisha. And he is tethered to his mobile and has a crush on a girl at school. Khalid also believes in Allah, although he sometimes wonders whether it is such a good idea to convert everybody in the world to Islam. One Friday morning, the quiet suburban life of Khalid’s family is turned upside down when an unwelcome visitor appears at the door. What follows is a hilarious—and poignant—intercultural encounter that explores love, socioeconomics, and religion and uncovers our common humanity even in the midst of difference. Channa Wickremesekera is a Sri Lankan-born writer and researcher in Melbourne. 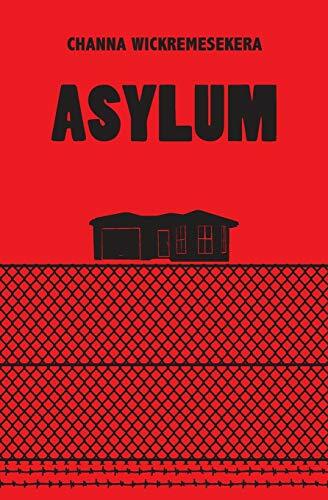 In addition to Asylum (Palaver 2015), his earlier works of fiction include Walls (self-published 2002), Distant Warriors (Hussein Publishing House 2005), In the Same Boat (Bay Owl Press 2010), and Tracks (self-published 2015), all of which deal with the migrant experience. He also is a historian who researches the military history of South Asia. His published works of history include Best Black Troops in the World: British Perceptions and the Making of the Sepoy, 1746–1805 (Manohar 2002) and Kandy at War: Indigenous Military Resistance to European Expansion in Sri Lanka, 1594–1818 (Vijitha Yapa Publications 2004). A third book on the separatist war in Sri Lanka will be published in late 2015. Born in Colombo, Sri Lanka, Channa Wickremesekera attended Royal College Colombo and then Monash University in Melbourne, where he obtained his Ph.D. in South Asian history in 1998. Although he began writing fiction early in life, he placed this passion on hold while at university. He returned to fiction writing after obtaining his doctorate. He has written five novels and novellas as well as two non-fiction books that focus on South Asian military history, with a third forthcoming. "A fun novel written in a jaunty teen voice-a novel that tries to tip our assumptions on their heads and succeeds." -Anna Funder, author of "Stasiland" and "All That I Am" "This is a timely novel, written with daring and imagination. It deals with themes that we urgently need to engage with and reflect upon, challenges that cry out for a long-overdue national conversation." -Arnold Zable, author of "Cafe Scheherazade," "The Fig Tree," and "Violin Lessons"